National Geographic Children's Books, 9781426310096, 192pp. Named one of the Best Children's Books of 2012 by Kirkus Reviews! Named one of the top Children's Books of 2012 by the New York Public Library! Beat softly on my window screen/Tick-tick-ticking-all silver green. She whispered secrets in my ear--/I am but a stranger here. The stars are scrawled across the sky/By ghostwriters, the Moon and I. You will not see me here tonight--/I have a thousand stars to write." What could be better than cuddling up with your child and this book on your lap and allowing your imaginations to soar with the words and images? 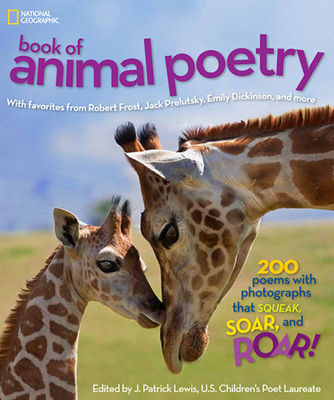 Lovingly selected by U.S. Children's Poet Laureate J. Patrick Lewis and paired with vibrant animal photography, this collection of poems is an exuberant celebration of the animal kingdom and a beautiful introduction to this genre of literature. Designed for family sharing but targeted to ages 4-8, this dynamic, fresh, yet still classic collection of animal poems is a must-have for the family bookshelf. Featured poets include J. Patrick Lewis, Dorothy Aldis, Emily Dickinson, Benjamin Franklin, Robert Frost, Rudyard Kipling, Jack Prelutsky, Elizabeth Madox Roberts, Robert Louis Stevenson, Alfred, Lord Tennyson, and many more. U.S. children's poet laureate for 2011-2013, J. PATRICK LEWIS is the author of more than fifty books of poetry for children, which find their shape in both free and formal verse and engage a wide range of subjects from history to mathematics, Russian folklore to the animal kingdom. His books for children include New York Times Best Illustrated Book The Last Resort (2002, illustrated by Roberto Innocenti and translated into more than a dozen languages) and The Shoe Tree of Chagrin (2001, illustrated by Chris Sheban), which won the Society of Children's Book Writers & Illustrators' Golden Kite Award. His children's poetry has been widely anthologized, and his contributions to children's literature have been recognized with the 2011 Poetry Award from the National Council of Teachers of English and the Ohioana Awards' 2004 Alice Louise Wood Memorial Prize. Named Best Poetry Book of 2012 by Bank Street Books! Named one of the 100 Magnificent Children's Books of 2012 by Fuse 8!